The Governor's journey to, uh, standing in front of the prison looking at Rick and Carl is complete, and his emotional journey takes him pretty much back to where we left him. I still have no idea why this needed two episodes. So we ended The Governor Side-Story Parte the Firste with the Guv holding the Little Girl in a pit, only to be found by his former minion Carlos. Carlos invites the whole gang to join his little group — mostly for the benefit of the women and the girl the Governor's traveling with — although I, personally, would have been content to let the dude who gunned down dozens of his own soldiers for fleeing a doomed battle to stay in the pit. Anyways, life continues. There's a zombie scene of no consequence. Eventually Carlos drives the Governor to go hit golf balls off the top his RV, away from all the other people in the camp, and needlessly, hilariously close to one of the zombie pits he and his crew have dug. Carlos mentions about sharing the leadership of the group with the Governor, which the Governor politely declines, and by "politely declines" I mean "hits him in the head with a golf club and drags him into the zombie pit to be eaten." Dollhouse's Enver Gkojic declares himself the new leader of the team, supported by his brother Fringe's Kirk Acevado. Enver is a nice guy, as evidenced by his not wanting to murder a whole second group they find to steal their supplies; Kirk is a bad guy, because he wants to murder them for their supplies — and when they happen to return to the camp mere hours later, they discover someone else has taken the whole "murder them and take their supplies" plan and run with it. That night, the Governor tries to take his makeshift family and leave, but is somehow completely thwarted by a mud pit full of zombies on the road (apparently, driving around the zombies or finding an alternate route was not an option). So. The Governor, despite killing a dude a mere day ago for even suggesting he take a few of the responsibilities for the group, stabs Enver and tells Kirk that Enver was too weak/nice to lead and he's taking charge. Kirk is surprisingly okay with this. The Guv drops the body in a lake, tells everyone Enver died on a supply run, and sets about turning the campsite into New Woodbury. He's setting up guards, stockpiling ammo, digging more pits and setting up barriers, etc. etc. And the episode ends with the Governor driving to prison, staring at it just like he did at the end of the episode before last, but this time he turns away from Carl and Rick and then sees Michonne and Herschel and aims his gun at them. The end. Parte the Seconde was better than Parte the Firste, because the Governor was somewhat proactive, albeit mostly in the "murdering people" department. And now at least there's a bit of a mystery as to why the Governor is going to attack the prison — is he just doing it for revenge, or does he honestly just want to take it over so his people can enjoy its safety? Is it both? Does the distinxtion really matter? That said, there's absolutely no way this needed to be two episodes long. Hell, I don't even know if it would could have filled up a single episode — surely we didn't need this episode's supply run to the cabin, or the lengthy "getting oxygen for dad" quest from last week. I understand they didn't want the Governor's transformation from hobo to family man to leader who will protect his people at all costs, but I'll take rushed over plodding any day of the week. 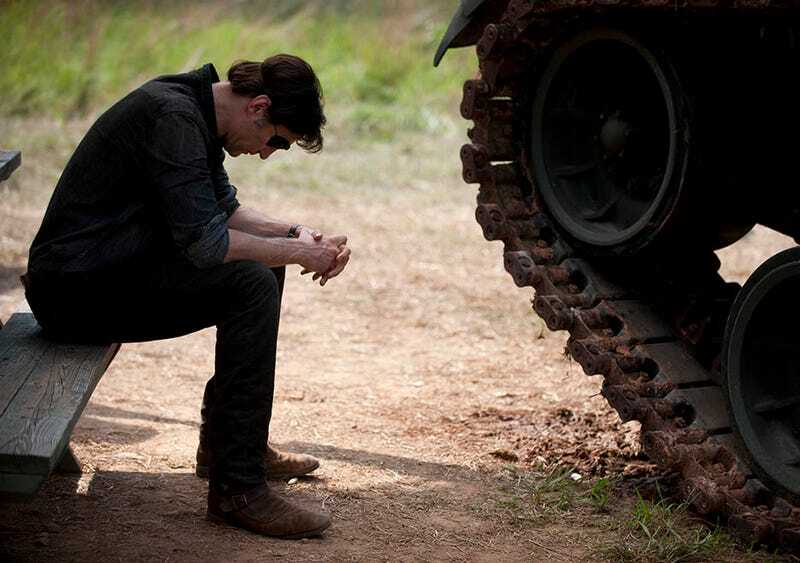 At any rate, next week is the mid-season finale and it looks like the Governor is going back to war with the prison, so I'm assuming things will pick up. The "on next week" episode promised "Some will fall! ", and I can't imagine The Walking Dead not killing at least one semi-major character, especially because it's been quite a while. My bet's on Maggie or Beth, but they could go for the gut-punch and kill Glenn. Place your bets in the comments, if you please. • I know some people complained that my lack of affection for these episodes is because I hate the Governor, but I stand by my assertion these episodes were just really slow and boring. As evidence, I present the "Previously On" clip from the beginning of this episode, which was pretty much the shortest one ever. • Also unnecessary: The endless shots in the beginning of the Governor doing laundry. • Why did the music swell so mournfully when the zombie mud pit was revealed? It seemed like the show wanted to think this was impressing and/or devastating, but it was just kind of silly. • So aren't Carol and the Governor pretty much the same now? I mean, sure, Carol killed two people who were sick and might have killed the group, and the Guv killed Enver, whose niceness was also probably going to kill the group. Just sayin'. • Despite surviving until the end of the episode, you'll note I still haven't learned the names of the woman the Governor hooked up with, her sister, and her daughter. If they survive the mid-season finale and appear to be sticking around in some capacity, I will actually learn them. Promise. Obviously, I don't think this is very likely to happen. • How awesome would it be if the prison repulsed the attack, and Governor mowed down this group of people too? "Dammit, now I have to get a third group. Why do I keep doing that?!"